You also can find author Carl McColman on Facebook, and on his blog. 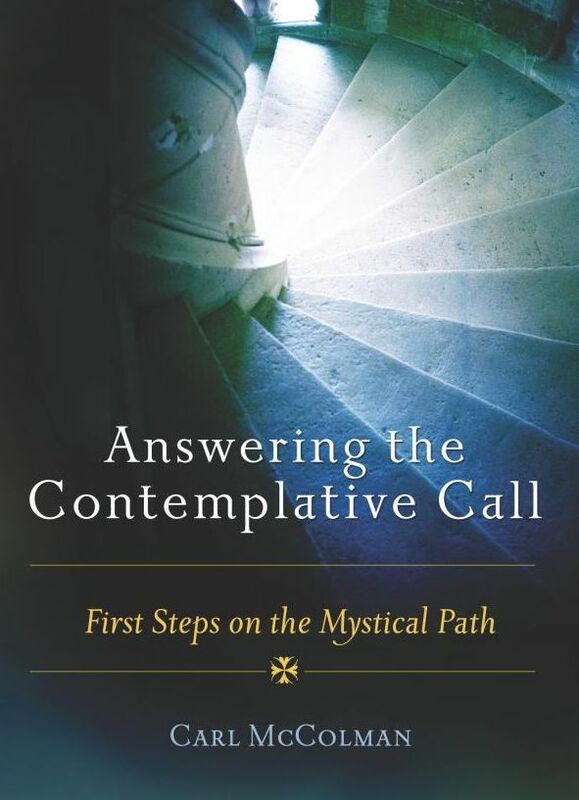 Answering the Contemplative Call is a primer, a guide for first encounters, a kind of Contemplative Practice 101 textbook, so it's not comprehensive. Like most introductory texts, the book covers a lot of territory, and attempts to define and describe a lot of concepts. Straightaway author Carl McColman cautions us how the lifelong practice the mystical journey, of engaging the mysteries of God, the mysteries of our lives, is more of a spiral than a straight line. The text of this book spirals around a lot, too, but that's part of what makes it engaging and fairly easy to read. I won't attempt to list the many historical and more contemporary lovers of God the author cites, but they include Thomas Aquinas, Thomas Merton, Evelyn Underhill, Julian of Norwich, the desert fathers and mothers, English and Spanish mystics, Augustine of Hippo, Hildegard of Bingen, Teresa of Avila, C.S. Lewis. We can place ourselves in their company! "and only then―do we start thinking about it." On page 38: "To behold implies a profound engagement with that which you see. It implies paying attention and truly being present. It implies not merely seeing, but holding―in your mind, in your heart, in your soul―that which you see. ...We have to be awake in order to behold. But we also have to be silent and present. It’s not something that a distracted heart or an anxious mind can easily embrace." As everyone who has walked alongside Jesus of Nazareth for any length of days realizes that in some ways the journey is solitary, but you still need to find companions, people to break bread with along the way. (page 65) A Spiritual director? Maybe. But also reach out and serve others in various ways. Related to those other people we need, on pages 80-81, McColman reminds us, "social / external /activist" dimension of anyone's relationships with Jesus Christ is essential. Essential for myself and also for most thoughtful, educated, activist, urban people in this 21st century, the "Befriend Silence" chapter (page 89) begins by saying we need to make a home for silence in our hearts. Silencing that incessant inner noise, blocking out cacophony from streets and peeps. I love that he says on page 94, contemplative silence "gives us the space to find wonder..."
Christian meditation is not about letting images or thoughts go; rather, like other forms of kataphatic spirituality, it is all about immersing ourselves in the Word of God. "In the beginning was the Word," begins the Gospel of John. And ever since the apostles wrote the New Testament epistles and the evangelists wrote the Gospels, the Christian wisdom tradition has been associated with the mysteries of language. ... To use language is an essential part of being human, and so the exploration of Christian wisdom includes a strong focus on the words of the first Christian teachers, as well as of the great saints and mystics throughout history. Finally, where does this twisty, turning, roundabout path of God's call to us, our awakening, beholding, and response to that call in contemplation lead? It's all about bringing heaven to earth, helping transform the world by being, demonstrating, and living the love of God. Answering the Contemplative Call is a smorgasbord of ideas and possibilities, one that could be an excellent gift for yourself, for a friend or an acquaintance.